This year's SuperBowl ads sometimes left little to the imagination, yet also provided some needed optimism about the future of the American dynasty...along with the slingshot babies and beer-retrieving canines. That’s all the ash-colored gentleman who survived the GM “Apocalypse” in last night’s SuperBowl advertising lineup had to say. And then Ford pounced, trying to convince GM to pull the ad from SuperBowl rotation, arguing it was misleading. Finally, some SuperBowl advertising drama! As promised, I was on a JetBlue plane flying back to Texas from California last night. The pilot joked before takeoff that he would get us up and off the ground as soon as possible, so we could get down to the business of watching the game, and then fate played a cruel joke as it took several longgg minutes for the DirecTV satellite to kick back in so we could join Al and Chris. So, I missed a number of the early SuperBowl commercials, but being the faithful marketing pundit that I am, I went back and watched them all this morning. I’ll give the overall year in SuperBowl advertising a “B-.” Better than past years, but still plenty of upside available based on the inventory I watched. Without any question, the most impactful spot of the evening was the “Imported from Detroit” spot starring Clint Eastwood. He had my attention from the moment I heard it was him, and the message was powerful, couldn’t have been in better context, and was the kind of economic and America cheerleading ad we could stand more of these days. What was it trying to sell? Cars? American exceptionalism? Detroit? All of the above? Yes. Beyond that, I try to think of those moments that were not only funny or interesting, but stuck with me and pulled their brand along with it. Remember, advertising’s supposed to sell! The nice, big dog from Doritos who blackmails its owner with a bag of chips so as not to spill the beans about the missing cat. But there’s little doubt, the night belonged to the automakers. 11 out of the 36 spots I counted were from car purveyors, not including the “Imported from Detroit” spot starring Eastwood. Not all of them were funny, and certainly not every single one of them was memorable, but they were there, en masse, in the aggregate as a seemingly strong industry spending big money to pitch their latest wares. That seemed to be a message in and of itself, a resurgent car market as leading indicator for an even more resurgent economy. And as Clint Eastwood reminded us all, it’s only halftime in America. I’ve been so busy here in San Francisco this week covering the IBM SmartCamp finals that I’ve not paid nearly enough attention to one of my favorite subjects this time of year, NFL Footbal. Never mind that I dumbly booked a trip back to Austin smack dab in the middle of the SuperBowl (thankfully I’ll be flying JetBlue, so I’m optimistic I’ll catch Madonna and the full second half of the game at 35,000 feet). 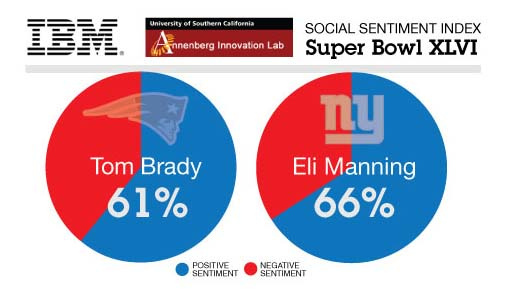 But before we ever get to the actual gridiron action, IBM has once again partnered with the University of South California Annenberg Innovation Lab to conduct a little social media smackdown analysis prior to the main event. Overnight results of Super Bowl Twitter buzz drove Giants quarterback Eli Manning’s ‘T score’ for positive sentiment ahead of Tom Brady. Manning now leads with 66% vs. Brady’s 61%, which represents an 8-point shift compared to the previous day. Specifically, they’ve already analyzed one million Tweets to determine which of the two quarterbacks, Tom Brady and Eli Manning, are the social media fan favorites. Thus far, it’s very close, and really depends on when you take the pulse, but to date, the Giants’ Eli Manning has a slight edge at 66% positive sentiment, compared to Tom Brady’s 61%. But that’s an 8-point shift from the prior day, so stay tuned. Meanwhile, on the virtual sidelines, Giants head coach Tom Coughlin has a 76% positive rating, above both all the other players and coaches on both teams. As you look into the rest of the roster, it’s the wide receivers getting all the attention, with Wes Welker #1 in positive sentiment, and Victor Cruz a close 2nd. This analysis, of course, though in all good fun, demonstrates the powerful influence social media are having on organizations, companies, governments, and brands. New analytics technologies make it possible to understand positive, negative and neutral sentiments, and can detect irony and even apply machine learning to distinguish between Tweets that are nothing but background noise from those that are truly brandshaking! But hey, if football’s not your thing, IBM and USC will also be following sentiment around the upcoming Academy Awards. More on that in a future post. In the meantime, learn more about IBM’s social analytics capabilities from our director of digital marketing and analytics, John Squire, in the video below. 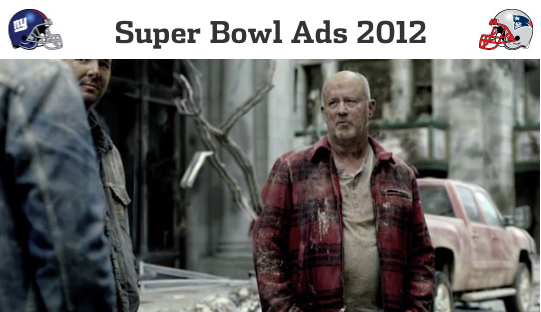 And the horrific lineup of this year’s SuperBowl ads. I would normally have chimed in yesterday with my witty two cents worth about the ads, but the only one that seemed to have even any motivating, selling power was the Eminem “Detroit’s Back” commercial, which I thought while watching was a full minute but turned out to be two. Meanwhile, I’m back in Austin where we had our once-in-a-decade snowstorm last Friday. Today, I spent much of the day at the TechTarget Online ROI Summit roadshow, learning about the latest and greatest in content syndication, e-nurturing, lead management, and yes, even social media and communities. If you’re in Paris and/or London or will be there on April 14 or 12 respectively, then prepare to check it out firsthand (particularly helpful for you IT marketers out there). Me, well, after Lotusphere, I’m knee deep in email and catchup. I’ll hope to catch up with you all again very soon.